Farmers and NGO staff working with them have begun trying out a variety of adaptations of SRI concepts and methods to other crops in addition to wheat, sugarcane, finger millet, and tef. Organizations in several countries have documented successes using SRI principles with other crops such as maize, pulses, turmeric, mustard, eggplant and other vegetables. Some of these are related below. Asif Sharif, currently CEO of Pedaver, has adapted SRI, conservation agriculture and organic agriculture (a combination he calls "paradoxical agriculture") to create a System of Maize Intensification (SMI) that involves raised beds and mechanization. (Click on comparison of furrows vs raised beds at right). In Madagascar in 1999, when Bruno Adrianaivo and Norman Uphoff visited the SRI farm of Ralalason at Soatanana, about two hours’ drive from the regional capital of Fianarantsoa, to see the field where Ralalason had had a record-setting SRI harvest that year, he described his own experiments with maize adapting SRI methods. This has not been independently verified, so the following information is offered to encourage others to try their own variations to see if they can get similar results. Ralalason said that from his SRI experience he had learned the value of applying a lot of compost to his soil, so he had put large amounts of compost on his maize field (about 8 x 10 meters). He was at the time very land-limited; however, his SRI successes have enabled him to triple his landholdings since the visit. Ralalason said that he had planted the hills about 40 cm apart with single seeds, using direct seeding, with no transplanting. When the maize tillers were 60-70 cm tall, he removed, carefully, the lowest leaf and the sheath that was attached to that leaf, wrapped around the tiller, down to the ground. This exposed the meristematic tissue in the culm first to the air and then to a ‘new environment’ (my interpretation) which he created by heaping a handful of compost up around the base of the plant, covering the culm with moist, dark organic matter 3-4 cm high. This ‘tricked’ the maize plant into resuming tillering, and Ralalason said that he got usually 5 more tillers growing up from each plant this way. He said further that he got 2-3 ears from each tiller, and they were all good ears. He could have gotten six tillers from a hill by planting six seeds. But then there would have been six root systems in close proximity, all competing for nutrients and space. This ‘trick’ was like grafting six tillers onto a single root system, which was growing in very rich, loose soil. Most soils in Madagascar, by contrast, are quite compacted, having little soil organic matter. Uphoff tried this technique in his garden back in Ithaca, NY, but did not see this effect, perhaps because he planted the maize one month past the recommended date. Glenn Lines, CIIFAD's team leader in Madagascar, tried the technique in his garden in Moramanga and saw the multiple-tillering effect. This is not a methodology that farmers with large maize fields would consider adopting because of its labor-intensity. But small farmers who have very little land and are getting low yields might try it, starting from a recognition that the key to success is increased soil organic matter, capitalized upon by plant management to induce multiple tillering. Ralalason, having very little land, invested his labor in collecting biomass from any and all possible sources: straw, weeds, banana leaves (for K), wild ginger (a weed high in P), leguminous shrubs, sawdust, miscellaneous animal manures, etc., to enhance his land’s fertility. His ‘theory’ for compost-making is to maximize the diversity of biomass sources. This seems to be working for him. Daisy, M., N. Thavaprakaash, K. Velayudham, and V. Divya. 2013. Effect of System of Crop Intensification (SCI) practices on growth, yield attributes and yield of castor hybrid YRCH. International Journal of Advanced Life Sciences. 6(4): 366-374. Deshmukh, Ravi C. Redgram gave bonus. Agricultural Technology Application Research Institute website. Shankar, G. A farmer’s innovation with pigeonpea. Grow More Pulses website. Prabu, M. J. 2012. Transplanting redgram, new technique for Karnataka ryots. The Hindu, Agriculture section. December 12. Erulan, Sathiyavani, Velayudham Kumaran and Thavaprakaash Nallasamy. 2012. System of Crop Intensification in Greengram: An Innovative Approach. 92 p. [SRI practices are being extrapolated to greengram, called System of Crop Intensification (SCI), a term used when applied to other other crops than rice. Available from More Books Publishing (49€)]. Several recent articles have reported on South Indian farmers getting higher red gram (pigeon pea) yields by using at least some of the SCI practices with their crop. Transplanting young seedlings with wide spacing (an 80% reduction in seed rate) and getting higher yields (by 50-200%) is achieved with more drought-stress and pest and disease resilience. Farmers are experimenting with direct-seeding (dibbling) rather than wider spacing to reduce labor requirements. 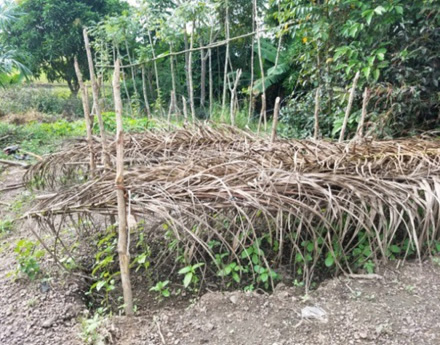 More evaluations need to be done to fully assess alternative crop establishment methods with pigeon pea SCI. (See articles by Prabu, Deshmukh, and Shankar for additional details). After experiencing good results with both SRI and adaptation of SRI principles to finger millet, the AME Foundation (AMEF) began trying out SRI principles on red gram with 35 farmers in five villages of Bangarpet Taluk in 2010-2011. Red gram, the practices promoted by AMEF include using less seed, transplanting seedlings of right age; wider spacing; weed management and other sustainable agriculture practices (in-situ soil and water management practices, seed treatment, use of bio agents, etc.). Transplanting 30-35 day old seedlings helps avoid low yields related to late planting in direct-seeded fields when rains are late. With the new system, the yield increased by more than 70% with farmers harvesting approximately 6 quintals per acre as opposed to the usual average yield in the area of 3.5 quintals/acre. (See the AMEF publication System of Crop Intensification: AMEF Experience in Red Gram for more information). Additional experiments undertaken between 2012 and 2015 (right) that are recorded in a publication by ICAR-KVK Bidar also show that the SCI red gram consistently out-performs the that grown with traditional methods.. Trials on castor bean (Ricinus communis) conducted during late Kharif 2012-2013 by M. Daisy et al at Tamil Nadu Agricultural University showed marked variations on productivity due to adoption of system of crop intensification (SCI) practices for Castor hybrid YRCH 1. Plants grown under 120 x 120 cm spacing with 100% NK and mechanical weeding twice at 30 and 60 DAS produced better yield besides being economically competitive and productive than other treatments. Locations where the mechanical weeders are not available, castor can be raised either 120 x 12 0 cm or 120 x 90 cm with 100% NK and hand weeding twice at 30 and 60 DAS for obtaining higher yield, oil yield and net return and per rupee invested. In Uttarakhand and Himachal Pradesh states of India, People's Science Institute got farmers to experiment in 2009, a drought year, with using SRI methods adapted to several leguminous crops: kidney beans (rajma), black gram, and soybean (N = 697, 314 and 77, respectively). The practices have been described in a note for SRI colleagues. The 2009 results were, overall, very promising, with a 69% increase for kidney beans (from 1.3 to 2.2 t/ha), a 57% increase for black gram (from 1.4 to 2.2 t/ha), and a 29% increase for soybean (from 2.8 to 3.6 t/ha) (see PSI PowerPoint presentation on SCI performance during drought). Farmers are just beginning to get acquainted and comfortable with these adaptations of growing methods, PSI reports, so they are hopeful of better results in the future. PRAN. 2013. SRI Method of Rapeseed Cultivation. Preservation and proliferation of rural resources and nature (PRAN) website. The application of SRI principles to mustard (rapeseed, canola) is spreading in India, particularly in the states of Bihar and West Bengal. Anil Verma, the PRADAN team leader in Gaya district, reports that a Bihar state government delegation of officers and specialists, measured the yield on the mustard field of one Gaya farmer as 4.8 t/ha, which greatly surpasses the usual yield of 1 t/ha. The state government is “quite excited about this,” Verma reports. Recommendations for adapting SRI principles to mustard can be found on pp. 10-18 of the booklet "Growing Crops with SRI Principles" from the SRI Secretariat in Bhubaneshwar. The Agricultural Production Commissioner of the state has visited fields of rapeseed and wheat cultivated under SCI/SRI practices, and large numbers of officials are also visiting these plots. 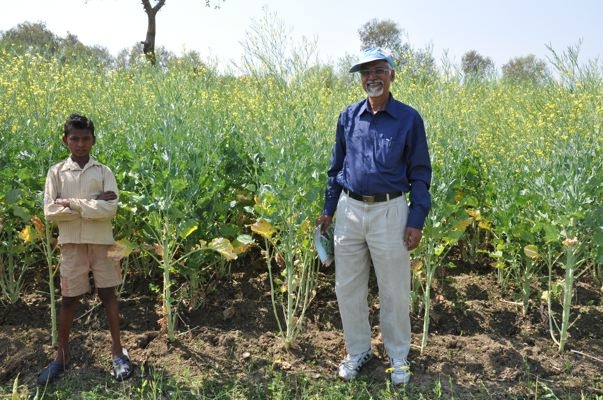 Dr. O. P. Rupela, retired senior scientist from ICRISAT, is shown at right standing with Gaya district farmer in front of his SCI mustard field. The farmer told Rupela and others visiting his farm on February 28, 2011, that he is now getting a yield over 3 t/ha, compared with his previous yield of 1 t/ha when using SRI concepts for his mustard crop. Organic fertilization (FYM) plus some biofertilizers are used, with some inorganic amendments too (the soil is low in boron, so borax is added). The management system requires just three irrigations, and soil-aerating weeding is done. The crop matures about 15 days earlier, as often reported for SRI with rice. Also in Orissa, the NGO Udyama which is active in SRI promotion in this state, reports some initial positive results from applying SRI concepts and methods to aubergine (eggplant or brinjal). A report from Udyama director Jayanta Kumar Panda says that some farmers have gotten double the usual aubergine yield on an area basis, and 1.5 x previous top yields. Wider spacing, organic fertilization, and other management changes are giving plants with many more blossoms and more and bigger fruits. This experience encourages farmers working with Udyama to see whether they too can get ‘more from less’ (fewer plants, fewer external inputs). Recommendations for adapting SRI principles to eggplant can be found on pp. 10-18 of the booklet "Growing Crops with SRI Principles" from the SRI Secretariat in Bhubaneshwar. Mark Fulford adapted SCI techniques for carrots in 2012 and 2014 on his farmer in Monroe, Maine, USA. During 2012, carrot seed was carefully hand-sown from a half-pint bottle with a small 1/8” hole drilled in the cap so that the seeds no closer than 1“ from each other. Small panes of plastic or glass window were placed on top of these rows randomly to predict the emergence. On emergence, the the entire bed was sprayed down with a course, low-pressure spray of apple cider vinegar at 1/2 strength with water dilution and a biodegradable dish soap or yucca extract soap, which killed the weeds, leaving the carrots free to emerge without the need to weed or thin for 40-45 days. From the 150 sq. 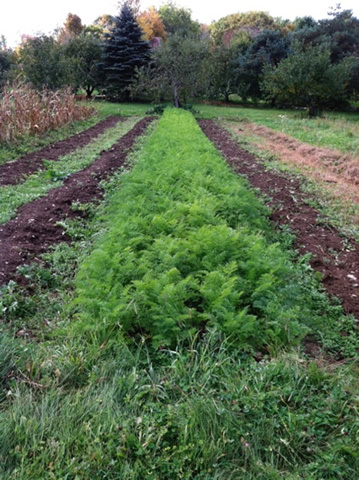 ft, 4-row carrot bed, Fulford harvested 254 lbs. (1.693 lbs per square foot) which amounts to a yield of 73,762 lbs/acre. (The recorded US average carrot yield per acre in 2010 was 26,800 lbs, with 33,750 lbs per acre considered as excellent). During 2014, the yield of no. 1 grade SCI carrots from a 410 sq. ft. plot (see photo at right) was extrapolated as 54,296 lbs/acre, with a gross yield of 65,262 lbs/acre. (20,000 lbs/acre is normally considered a good yield.) The value of just the no. 1 grade carrots worked out to a potential profit of $67,870 gross per acre at wholesale prices (before subtracting input costs). The SCI-modified practices can be found in Fulford's 2014 report (which contains the details of both the 2012 and 2014 seasons). While we do not have much information on SRI-inspired potato cultivation, a Jan. 27, 2012, article in the Indian Express, noted that potato farmers in the Nelanda district of Bihar were inspired by attention being paid to SRI rice farmers because of their huge rice yields. We look forward to hearing whether SRI adaptations to potatoes will increase their yields as well. the yield was 73,762 lbs per acre. (with US average carrot in 2010 at 26,800 lbs). Estimated value of marketable carrots per acre @ organic wholesale price of $0.80 to 1.00 per lb was $45,910, using the intensified methods described above! P. Baskaran, from Thumbal in Tamil Nadu's Salem District, has authored a manual on adapting SRI principles for turmeric. He says that the new methods, called Sustainable Turmeric Initiative (STI), yield 12.5 tons/acre while the usual yield is 10 tons/acre for conventional methods. With STI, sections of seed rhizomes weighing 20 to 35 grams each (180 kg/acre) are planted in a nursery and transplanted at about 40 days (see photo at right). SRI spacing between rows is 40 cm and between plants is 30 cm, while conventional spacing is 30 cm by 30 cm. Fertilization is not much different (drip irrigation and fertigation), but organic fertilization is increased with green manure (dhaincha) and other organic inputs.